Enabled by default: Starting with GitLab 11.3, the Auto DevOps pipeline is enabled by default for all projects. If it has not been explicitly enabled for the project, Auto DevOps will be automatically disabled on the first pipeline failure. Your project will continue to use an alternative CI/CD configuration file if one is found. A GitLab administrator can change this setting in the admin area. Note: If you do not have Kubernetes or Prometheus installed, then Auto Review Apps, Auto Deploy, and Auto Monitoring will be silently skipped. Note AUTO_DEVOPS_DOMAIN environment variable is deprecated and is scheduled to be removed. Note The Auto DevOps base domain variable (KUBE_INGRESS_BASE_DOMAIN) follows the same order of precedence as other environment variables. Navigate to your project’s Operations > Kubernetes and create the Kubernetes clusters with their respective environment scope as described from the table above. Navigate to each cluster’s page, through Operations > Kubernetes, and add the domain based on its Ingress IP address. Note: From GitLab 11.8, KUBE_INGRESS_BASE_DOMAIN replaces AUTO_DEVOPS_DOMAIN. AUTO_DEVOPS_DOMAIN is scheduled to be removed. Note: Even when disabled at the instance level, group owners and project maintainers are still able to enable Auto DevOps at group-level and project-level, respectively. Go to group’s Settings > CI/CD > Auto DevOps page. Toggle the Default to Auto DevOps pipeline checkbox (checked to enable, unchecked to disable). Click Save changes button for the changes to take effect. When enabling or disabling Auto DevOps at group-level, group configuration will be implicitly used for the subgroups and projects inside that group, unless Auto DevOps is specifically enabled or disabled on the subgroup or project. Note Only administrators and group owners are allowed to enable or disable Auto DevOps at group-level. If enabling, check that your project doesn’t have a .gitlab-ci.yml, or if one exists, remove it. Go to your project’s Settings > CI/CD > Auto DevOps. When enabling, it’s optional but recommended to add in the base domain that will be used by Auto DevOps to deploy your application and choose the deployment strategy. Note: For GitLab versions 10.0 - 10.2, when enabling Auto DevOps, a pipeline needs to be manually triggered either by pushing a new commit to the repository or by visiting https://example.gitlab.com/<username>/<project>/pipelines/new and creating a new pipeline for your default branch, generally master. Note: There is also a feature flag to enable Auto DevOps to a percentage of projects which can be enabled from the console with Feature.get(:force_autodevops_on_by_default).enable_percentage_of_actors(10). You can change the deployment strategy used by Auto DevOps by going to your project’s Settings > CI/CD > Auto DevOps. If a project’s repository contains a Dockerfile, Auto Build will use docker build to create a Docker image. Auto Build builds an application using a project’s Dockerfile if present, or otherwise it will use Herokuish and Heroku buildpacks to automatically detect and build the application into a Docker image. Tip: If Auto Build fails despite the project meeting the buildpack requirements, set a project variable TRACE=true to enable verbose logging, which may help to troubleshoot. Note: Auto Test uses tests you already have in your application. If there are no tests, it’s up to you to add them. Static Application Security Testing (SAST) uses the SAST Docker image to run static analysis on the current code and checks for potential security issues. Once the report is created, it’s uploaded as an artifact which you can later download and check out. Any security warnings are also shown in the merge request widget. Read more how SAST works. Note: The Auto SAST stage will be skipped on licenses other than Ultimate. Note: The Auto SAST job requires GitLab Runner 11.5 or above. Dependency Scanning uses the Dependency Scanning Docker image to run analysis on the project dependencies and checks for potential security issues. Once the report is created, it’s uploaded as an artifact which you can later download and check out. Any security warnings are also shown in the merge request widget. Read more about Dependency Scanning. Note: The Auto Dependency Scanning stage will be skipped on licenses other than Ultimate. Note: The Auto Dependency Scanning job requires GitLab Runner 11.5 or above. License Management uses the License Management Docker image to search the project dependencies for their license. Once the report is created, it’s uploaded as an artifact which you can later download and check out. Any licenses are also shown in the merge request widget. Read more how License Management works. Note: The Auto License Management stage will be skipped on licenses other than Ultimate. Vulnerability Static Analysis for containers uses Clair to run static analysis on a Docker image and checks for potential security issues. Once the report is created, it’s uploaded as an artifact which you can later download and check out. Any security warnings are also shown in the merge request widget. Read more how Container Scanning works. Note: The Auto Container Scanning stage will be skipped on licenses other than Ultimate. Note: This is an optional step, since many projects do not have a Kubernetes cluster available. If the requirements are not met, the job will silently be skipped. Review Apps are temporary application environments based on the branch’s code so developers, designers, QA, product managers, and other reviewers can actually see and interact with code changes as part of the review process. Auto Review Apps create a Review App for each branch. The Review App will have a unique URL based on the project ID, the branch or tag name, and a unique number, combined with the Auto DevOps base domain. For example, 13083-review-project-branch-123456.example.com. A link to the Review App shows up in the merge request widget for easy discovery. When the branch or tag is deleted, for example after the merge request is merged, the Review App will automatically be deleted. Review apps are deployed using the auto-deploy-app chart with Helm. The app will be deployed into the Kubernetes namespace for the environment. Since GitLab 11.4, a local Tiller is used. Previous versions of GitLab had a Tiller installed in the project namespace. Caution: Your apps should not be manipulated outside of Helm (using Kubernetes directly). This can cause confusion with Helm not detecting the change and subsequent deploys with Auto DevOps can undo your changes. Also, if you change something and want to undo it by deploying again, Helm may not detect that anything changed in the first place, and thus not realize that it needs to re-apply the old config. Dynamic Application Security Testing (DAST) uses the popular open source tool OWASP ZAProxy to perform an analysis on the current code and checks for potential security issues. Once the report is created, it’s uploaded as an artifact which you can later download and check out. Any security warnings are also shown in the merge request widget. Read how DAST works. Note: The Auto DAST stage will be skipped on licenses other than Ultimate. After a branch or merge request is merged into the project’s default branch (usually master), Auto Deploy deploys the application to a production environment in the Kubernetes cluster, with a namespace based on the project name and unique project ID, for example project-4321. Auto Deploy doesn’t include deployments to staging or canary by default, but the Auto DevOps template contains job definitions for these tasks if you want to enable them. Apps are deployed using the auto-deploy-app chart with Helm. The app will be deployed into the Kubernetes namespace for the environment. If the GitLab Deploy Token cannot be found, CI_REGISTRY_PASSWORD is used. Note that CI_REGISTRY_PASSWORD is only valid during deployment. This means that Kubernetes will be able to successfully pull the container image during deployment but in cases where the image needs to be pulled again, e.g. after pod eviction, Kubernetes will fail to do so as it will be attempting to fetch the image using CI_REGISTRY_PASSWORD. Note: When the GitLab Deploy Token has been manually revoked, it won’t be automatically created. Note: Check the requirements for Auto Monitoring to make this stage work. Once your application is deployed, Auto Monitoring makes it possible to monitor your application’s server and response metrics right out of the box. 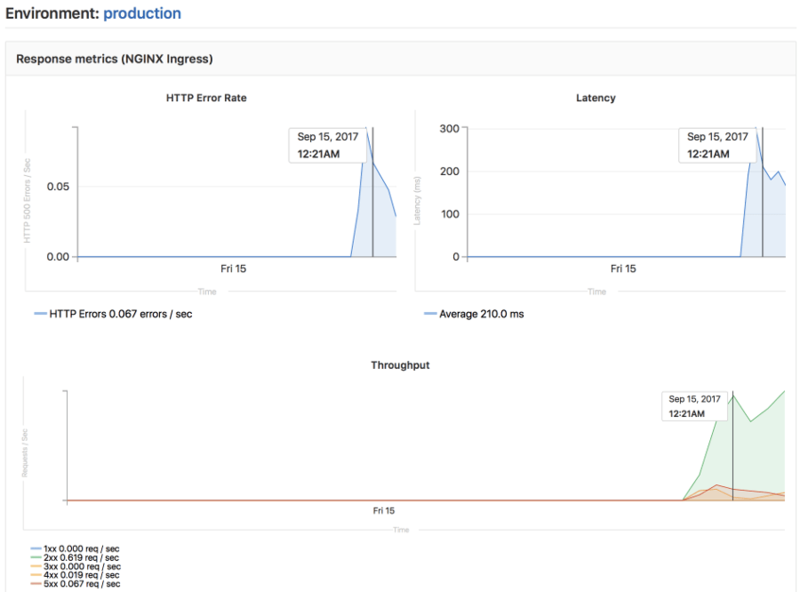 Auto Monitoring uses Prometheus to get system metrics such as CPU and memory usage directly from Kubernetes, and response metrics such as HTTP error rates, latency, and throughput from the NGINX server. .buildpacks file - Add a file in your project’s repo called .buildpacks and add the URL of the buildpack to use on a line in the file. If you want to use multiple buildpacks, you can enter them in, one on each line. Caution: Using multiple buildpacks isn’t yet supported by Auto DevOps. If you want to modify the CI/CD pipeline used by Auto DevOps, you can copy the Auto DevOps template into your project’s repo and edit as you see fit. Tip: The Auto DevOps template includes useful comments to help you customize it. For example, if you want deployments to go to a staging environment instead of directly to a production one, you can enable the staging job by renaming .staging to staging. Then make sure to uncomment the when key of the production job to turn it into a manual action instead of deploying automatically. If you only require a subset of the features offered by Auto-DevOps, you can include individual Auto-DevOps jobs into your own .gitlab-ci.yml. Consult the Auto DevOps template for information on available jobs. DB_INITIALIZE From GitLab 11.4, this variable can be used to specify the command to run to initialize the application’s PostgreSQL database. It runs inside the application pod. DB_MIGRATE From GitLab 11.4, this variable can be used to specify the command to run to migrate the application’s PostgreSQL database. It runs inside the application pod. LICENSE_MANAGEMENT_DISABLED From GitLab 11.0, this variable can be used to disable the license_management job. If the variable is present, the job will not be created. HELM_UPGRADE_EXTRA_ARGS From GitLab 11.11, this variable allows extra arguments in helm commands when deploying the application. Note that using quotes will not prevent word splitting. Tip: Set up the replica variables using a project variable and scale your application by just redeploying it! Caution: You should not scale your application using Kubernetes directly. This can cause confusion with Helm not detecting the change, and subsequent deploys with Auto DevOps can undo your changes. Go to your project’s Settings > CI/CD, then expand the section called Variables. Caution: Variables with multiline values are not currently supported due to limitations with the current Auto DevOps scripting environment. Note: Environment variables are generally considered immutable in a Kubernetes pod. Therefore, if you update an application secret without changing any code then manually create a new pipeline, you will find that any running application pods will not have the updated secrets. In this case, you can either push a code update to GitLab to force the Kubernetes Deployment to recreate pods or manually delete running pods to cause Kubernetes to create new pods with updated secrets. That way, you can define your own TRACK_ENV_REPLICAS variables with which you will be able to scale the pod’s replicas easily. Tip: You can also set this inside your project’s settings. If STAGING_ENABLED is defined in your project (e.g., set STAGING_ENABLED to 1 as a CI/CD variable), then the application will be automatically deployed to a staging environment, and a production_manual job will be created for you when you’re ready to manually deploy to production. production_manual which is to be used by you when you’re ready to manually deploy to production. To start a job, click on the play icon next to the job’s name. You are not required to go from 10% to 100%, you can jump to whatever job you want. You can also scale down by running a lower percentage job, just before hitting 100%. Once you get to 100%, you cannot scale down, and you’d have to roll back by redeploying the old version using the rollback button in the environment page. Caution: Before GitLab 11.4 this feature was enabled by the presence of the INCREMENTAL_ROLLOUT_ENABLED environment variable. This configuration is deprecated and will be removed in the future. It’s enabled by setting the INCREMENTAL_ROLLOUT_MODE variable to timed. Note: Not all buildpacks support Auto Test yet, as it’s a relatively new enhancement. All of Heroku’s officially supported languages support it, and some third-party buildpacks as well e.g., Go, Node, Java, PHP, Python, Ruby, Gradle, Scala, and Elixir all support Auto Test, but notably the multi-buildpack does not. Caution: Private project support in Auto DevOps is experimental. When a project has been marked as private, GitLab’s Container Registry requires authentication when downloading containers. Auto DevOps will automatically provide the required authentication information to Kubernetes, allowing temporary access to the registry. Authentication credentials will be valid while the pipeline is running, allowing for a successful initial deployment. Auto Deploy will fail if GitLab can not create a Kubernetes namespace and service account for your project. For help debugging this issue, see Troubleshooting failed deployment jobs.